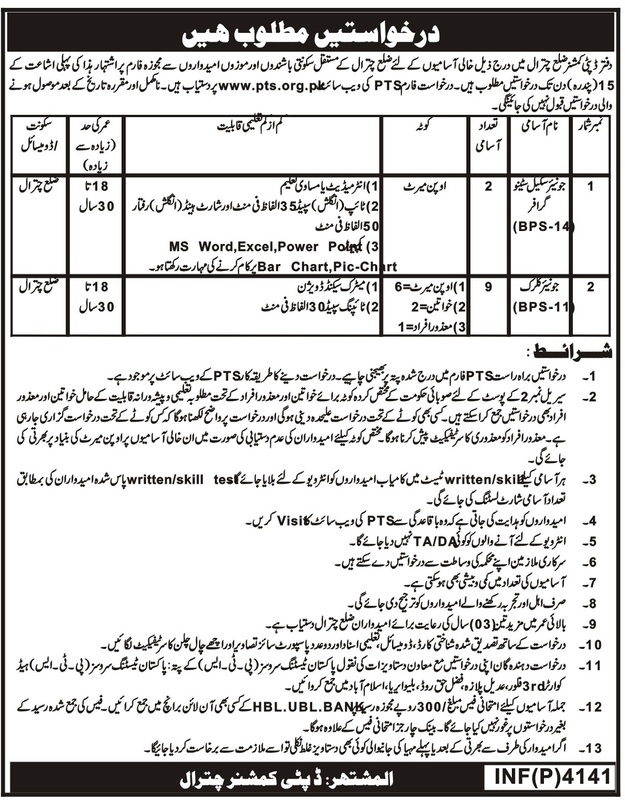 Deputy Commissioner Office Chitral Khyber Pakhtunkhwa. Qualification: Intermediate or equivalent with English typing speed of 35 wpm and shorthand English speed 50 wpm. Qualification: Matric with the 2nd division with English typing speed of 30 wpm. Application form can be download from Pakistan Testing Service (PTS) website. www.pts.org.pk. Applications can be submitted to the office of Pakistan Testing Service (PTS) Headquarters, 3rd Floor, Adeel Plaza, Fazal-e-Haq Road, Blue Area, Islamabad. within 15 Days from the publication of this advertisement. No TA/DA will be paid to candidates for the interview. Competent Authority has rights to increase or decrease the No. of Posts. Serving Government Employee applies through proper channel.